The epidermal growth factor receptor (EGFR) regulates a plethora of cellular and tissue functions in epithelia including cell division, survival, differentiation, and migration. 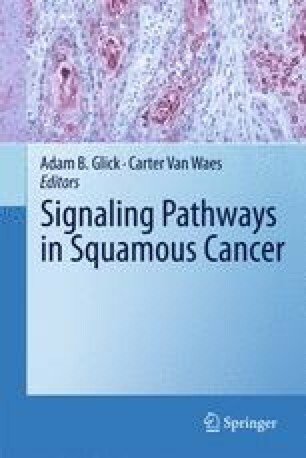 EGFR signaling is up-regulated in pathologies involving aberrant growth like squamous cancer, and facilitates neoplastic progression. Many mechanisms through which the effects of EGFR are modulated in normal and pathological processes have been identified. In particular, recent research has yielded important and surprising insights into the effects of EGFR-dependent signaling on cutaneous biology and carcinogenesis. This review focuses on EGFR signaling in normal biology and squamous cancer, with emphasis on the skin as a model organ to illustrate the biological significance of EGFR signaling.